This is where you wanna stay! 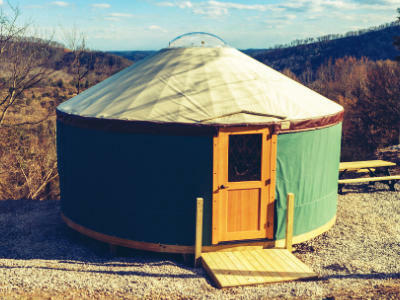 We have cabins, RV sites, primitive spots and can you believe we have yurts?! Bathhouses for those who rough it and a few pavilions for those group dinners y’all like to have! Your stay will be amazing at Windrock Park Campground! Call 865-435-1251 or book them online! Guests with existing reservations have the opportunity to renew for the following year before any new reservations will be taken. Reservations must be made in person or via phone conversation with a campground front desk employee. The same is true for cancellations and changes to existing reservations. We DO NOT accept reservations, changes to reservations, or cancellations via email or voicemail. NO EXCEPTIONS. 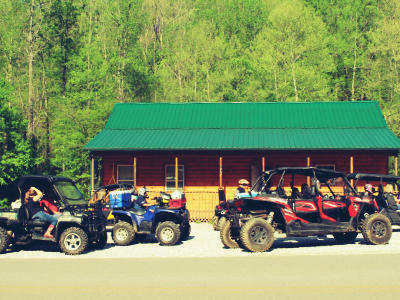 WE RESERVE THE RIGHT TO TRANSFER YOUR STAY TO ANOTHER CABIN OR CAMPSITE AT ANY TIME. However, we will honor your wishes whenever possible. Windrock Park Campground is not responsible for any lost, stolen, or damaged property. A major credit/debit card is required to hold Cabin and RV reservations. We reserve the right to discharge any person(s) for failing to abide by our rules. Any guest evicted from the premises will forfeit all money paid. No credits will be issued. NO REFUNDS on rentals, camping, reservations, permits, merchandise, etc. This policy includes (but is not limited to) inclement weather conditions as off-roading and camping are outdoor experiences and we cannot control the weather. Each cabin is professionally treated by a licensed pest control service on a regular basis. However, you are in the mountains and may occasionally encounter wild animals and/or insects. No refunds or adjustments will be given in these instances. Campsites may not be occupied until vacated by previous renter. Cabins may not be occupied until vacated by previous renter and cleaned in full by our housekeeping staff. If a guest is late checking out and the next reserved guest has arrived we will be forced to tow remaining vehicles/trailers at the owner’s expense. We will not make a guest with reservations wait to check in because someone is parked in their place. Guests are responsible for making late arrival arrangements and assume all risk for late arrival. Cabins: YOU WILL NOT BE ABLE TO GET INTO YOUR CABIN UNLESS YOU CALL THE OFFICE BEFORE WE CLOSE ON THE SCHEDULED DATE OF ARRIVAL. Please call by 5:00pm EST to make late arrival arrangements. Campsites: Please call the office by 5:00pm EST to make late arrival arrangements. Make sure you know which site is yours. You will be asked to move immediately if you set up on the wrong site. If not moved in a timely fashion, we will be forced to tow the vehicle(s) at the owners’ expense. Late arrivals are required to check-in at the campground office on the following morning. We are more than happy to accommodate walk-in customers if we have availability. There is never any guarantee that we will be able to accommodate a walk-in customer. Please make reservations in advance whenever possible. There is a 3 night minimum stay during Jamborees on ALL cabins, RV full hook-up sites, primitive sites #1-26, and the bunk house. 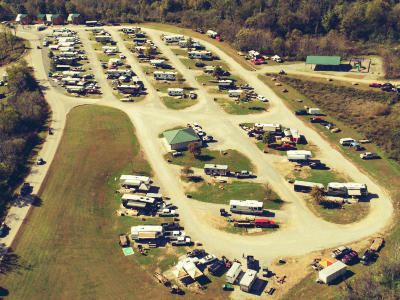 On the Sunday following each Jamboree guests may renew their cabin or RV full hook-up site reservation for the following year. Renewals will not be made any sooner than the Sunday following a Jamboree. Renewals are made from Fall Jam to Fall Jam and from Spring Jam to Spring Jam. Any reservation that is not renewed by the end of business on Sunday will be available for new reservations at 8:00am on the Monday following each Jamboree. Primitive & RV Overflow: There is no guarantee of a specific site or area. There is no guarantee that 2 or more sites will be side by side. These reservations guarantee only that the guest will have a place to camp. After guest has checked in at the campground office a parking attendant will take the guest to the next available site. There is no charge for cancellations made at least 7 days prior to the scheduled date of arrival. Cancellations made within 7 days of scheduled arrival date will result in a penalty fee equal to one night’s stay, including tax, to be charged on the credit/debit card used to hold the reservation. Cancellations made on the date of arrival will be treated as a No Call/No Show. A No Call/No Show will be charged the total amount of the reserved stay. Cancellations can NOT be made via text message, voicemail, or email. You must actually speak with a Campground employee in order to cancel a reservation and avoid the cancellation penalty fee. We will not accept a voicemail cancellation. Keep pet on a leash. Do NOT leave pet unattended without first placing him or her in a kennel. Pet must be fully house trained when staying in a cabin. Continuous loud barking after 11:00pm will result in eviction from cabin and/or campground. Failure to properly clean up after your pet may result in a charge of no less than $50.00 to be charged to the credit/debitcard used to hold the reservation. Instances of pet charges include, but are not limited to: excess pet fur in the cabin, damage to property, lingering odors, etc.Housekeeping and Cabin SuppliesWe charge a cleaning fee for a full cleaning to be done at the end of your stay. If there is a need for any extra or excessive cleaning upon your departure you will be charged a minimum of $50.00. The charge may be more depending on the nature of the mess and/or damage. You will also be responsible for the cost of any property needing to be replaced. The total amount will be determined by management and our cleaning staff. Smoking is NOT allowed in any of our cabins. • Each deluxe rental unit is provided with a complimentary STARTER supply of bed linens, towels, wash clothes, bath soap, toilet tissue, trash bags, dishwashing liquid, and dishwasher detergent. We do NOT give additional supplies beyond the starter set. Guest may exchange used towels, washcloths, and hand towels at the office once during a 3-5 night stay or twice during a 6 night or more stay. We do not exchange linens during a 2 night stay. Extra bed linens and additional supplies should be brought by the guest. Additional supplies can be purchased at any of several local stores and grocery stores. WE DO NOT PROVIDE DAILY MAID SERVICE. Bed linens are ONLY changed upon your departure. If your bed linens MUST be replaced during your stay, there is a $25.00 linen laundering fee. Tipping the housekeeping staff is very much appreciated. Our staff works very hard to make your stay as comfortable as possible. Responsible consumption of alcohol is permitted at the campground and in your cabins only. Alcohol is NOT allowed on the trails. Any vehicle entering the trail system is subject to a search for alcohol. Firewood, fire starters, and kindling must be certified (purchased or obtained within 30 miles of the campground). EACH PERSON will need a Land Use Permit. They are available at the Campground Office and at the General Store. For additional information, please contact the Campground Office during office hours at 865-435-1251.